At the climax of the American Civil War the armies of the Confederacy were pressed back into their heartland as the rebellion tried desperately to sustain itself against Union forces. 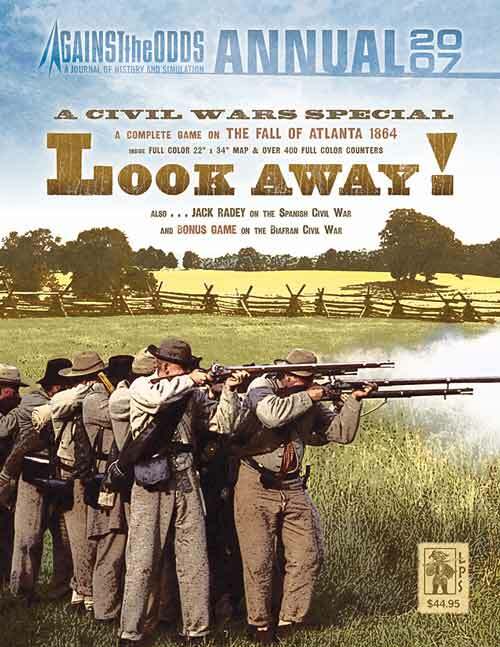 One of the most important campaigns occurred in southeastern Tennessee and Georgia, as Federal armies pressed toward the Confederacy's vital city of Atlanta, home to much of its remaining industry and gateway to the southern and western lands the Confederates still held. The campaign for and siege of this vital city broke the power of the Army of Tennessee, the key rebel command outside northern Virginia. The theater of operations was roughly bounded by the Tennessee River to the north, the Chattanooga area to the west, Atlanta to the south, and the Appalachian Mountains to the east. It was here where the formidable Union command team of Sherman and Thomas plied their trade, dooming the Confederacy's last chance to survive the Yankee onslaught. Here too rebel soldiers in the Army of Tennessee fought stubbornly to defend their homes. Look Away! 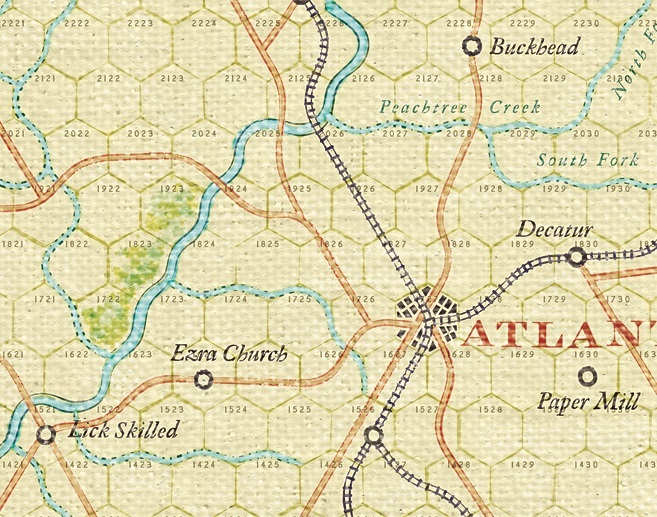 is a strategic-operational simulation of the Army of Tennessee's campaigns in the Georgia theater of the Civil War. The game covers the fighting between Union and Confederate forces in Tennessee and northern Georgia during the spring and summer of 1864. Each hexagon represents an area roughly 2.6 miles in diameter (4 km). Each turn in the game represents about four days of real time. 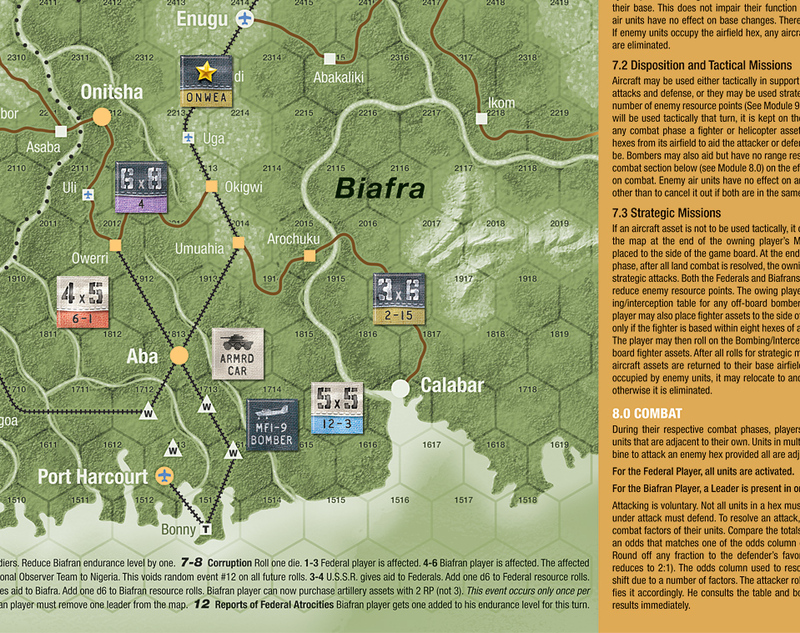 There are four scenarios dealing with the major engagements of the war plus a campaign game covering the entire period. See more Look Away! game graphics.